Hernan D Urrego, MD, Aliu Sanni, MD, Juan P Toro, MD, S. Scott Davis, MD, John F Sweeney, MD, Edward Lin, DO, Ankit D Patel, MD. Emory University. One of the barriers to the acceptance of the use of robotics in bariatric surgery has been the overall increase in perioperative and operative times compared to laparoscopy. Several studies have shown an increase in operative times during the early learning curves. However, there is limited information regarding the effect of setup times to the overall time spent in the operating room. We compared the OR times of both laparoscopic and robotic assisted sleeve gastrectomies to determine the area of least efficiency. This study was conducted at an academic teaching hospital. We identified 25 consecutive laparoscopic (LSG) and robotic sleeve gastrectomies (RSG) performed by a single team starting from the beginning of the academic year. 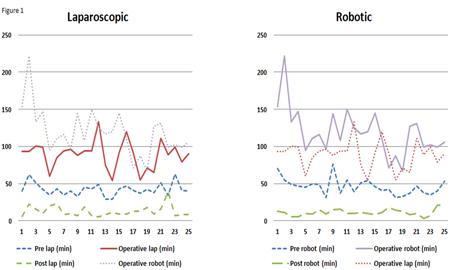 Using the operative log, we compared the pre-operative (patient enters OR to skin-incision), operative (incision, docking of robot, to skin closure), and post-operative (skin closure to out of OR) times for each of the cases. ANOVA analysis comparing robotic to laparoscopic times was performed. Results are presented as mean ± SD. The primary contributor to the longer duration of a robotic case is the operative time. Similar operative times can be achieved after surpassing a learning curve. Our team is now able to consistently complete three consecutive robotic sleeve gastrectomies by 3:30. Importantly, our experience also demonstrates that the robot setup, including anesthesia time, does not increase the overall operative time despite the patient preparation and positioning needed for the robotic platform. The robot can be utilized efficiently in bariatric surgery cases without considerable increases in operating room times.